I like how KHON2 news always has the visual satellite images of Olivia playing in the background. Gives perspective to the size of the storm for their viewers. Checking in from Central Oahu for the second time this season. It's nice to see an unshrouded pinwheel approaching rather than something cloaked in deep convection. Nonetheless, I still anticipate more stormy weather than we received from Lane. Stay safe fellow Hawaii residents! What is happening to the northeast of the system? is that bursts of convection? Mauistorms wrote: What is happening to the northeast of the system? is that bursts of convection? Looks like it if you watch the floaters. Did the same thing yesterday too. 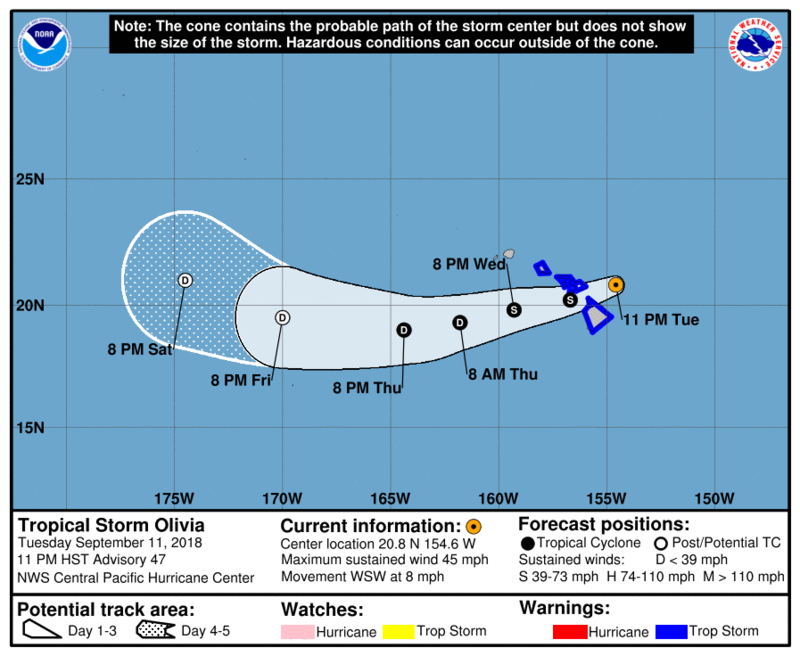 Olivia seems to be right off the tip of the Big Island. I wonder if she'll crash into Big Island or go into the channel. I don't know if my eyes are deceiving me but does it look like the LLC has gone due west for a couple of the last frames? Huaka wrote: I don't know if my eyes are deceiving me but does it look like the LLC has gone due west for a couple of the last frames? It's slowed down quite a bit and with the center this exposed it's going to be "wobbling" a bit. Still think the landfall point will be Maui or Molokai or something in between. That being said, its current forward speed being slow is a worry as that means there could be increased flooding to certain areas. Latest CPHC advisory is down to 45mph winds. Although all the models show this moving west over Maui and Molokai, including 06z German ICON model. Convection is popping up on the northeast part of the storm. 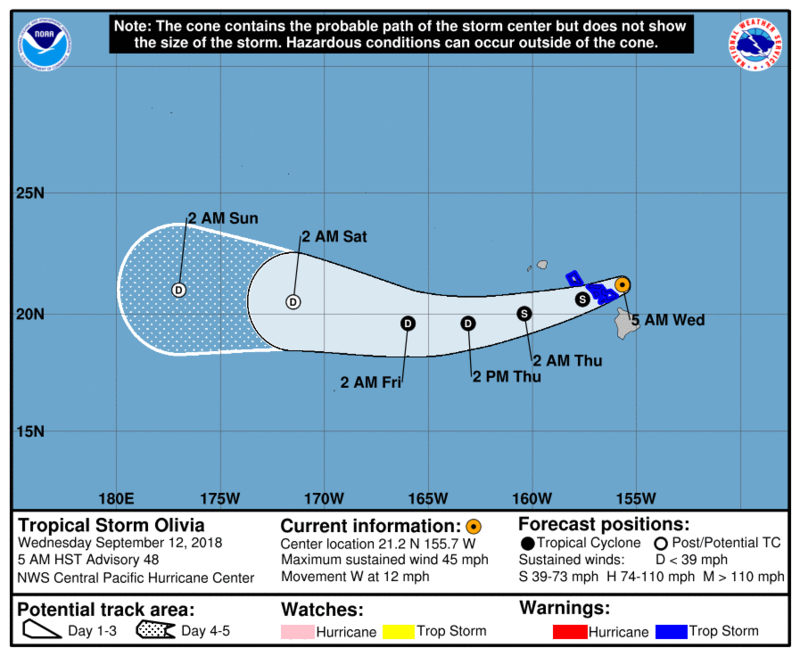 It's a good thing Olivia wasn't stronger or moving faster through the islands or we could've had a repeat of the 1871 hurricane. speed. The motion estimate for this advisory is 250/7 kt. day 5, but there is a decent chance this will happen even sooner. localized areas of strongly enhanced wind gusts and rainfall. The hurricane models HMON and HWRF will be out in an hour or so, best to use those for intensity at this stage. Last edited by Kingarabian on Wed Sep 12, 2018 4:35 am, edited 1 time in total. I wonder if the LLC is trying to go towards the thunderstorms instead of just continuing on its way. Or the thunderstorms creeping closer to the LLC. Huaka wrote: I wonder if the LLC is trying to go towards the thunderstorms instead of just continuing on its way. Or the thunderstorms creeping closer to the LLC. Convection usually pulls the LLC towards it which is also why were seeing drastic shifts in the storms speeds. Getting some rain now. Hopefully by the time I wake up it won't be flooded out. Looks to me like she'll skirt the edges of Maui and plow over Molokai into Oahu. Winds starting to pick up here. Not much rain yet.